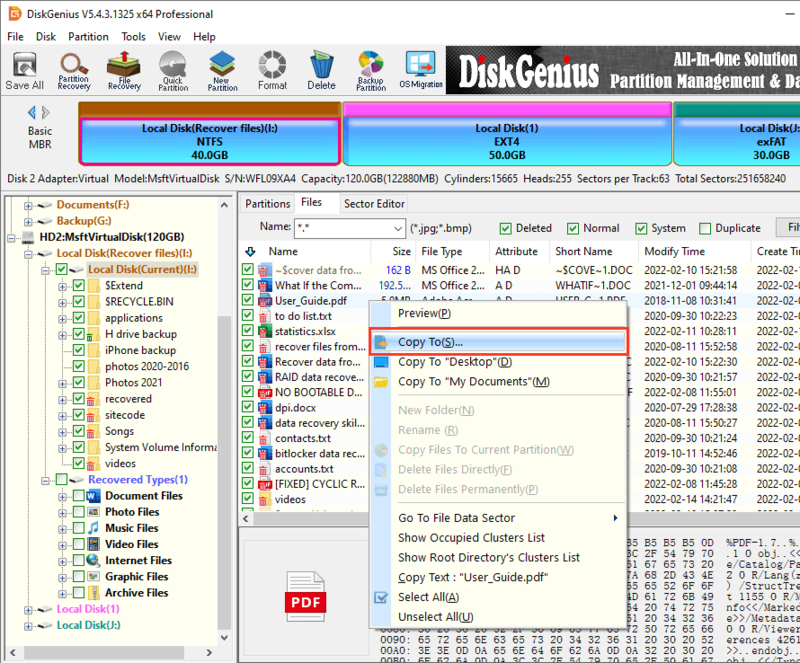 DiskGenius is complete DIY data recovery software. It offers advanced scan technology to scan the drive and find every recoverable file. It means you can recover lost data at anytime, at anywhere with this data recovery technique. What is data recovery technique? The deleted or lost data is lost forever? If you have these questions, just read this article. We will show you advanced data recovery techniques and help you recover deleted/lost data even your hard drive gets crashed. But, before you learn more about data recovery techniques, you should protect your data when your data is deleted or lost. When you delete your data or format a hard drive, your data is not really lost. The file system only deletes the entry of the data. For example, when you delete some files in Windows and empty the recycle bin, the system only removes the pointer of the files and makes the storage space of the deleted files be available. Before new files completely overwrite the storage space of the deleted files, the deleted files can be easily recovered by data recovery techniques. Data recovery technique is a process of recovering deleted, inaccessible, lost, corrupted, damaged or formatted data from PC, hard drive, secondary storage, removable media, when the data stored in them cannot be accessed in a normal way. There are thousands of data recovery techniques in the internet. Many companies offer data recovery techniques which can recover lost data from hard drive, USB flash drive, memory card, digital camera, etc. Deleted file recovery and recycle bin data recovery. Formatted file recovery; reformatted file recovery. Unlike other data recovery techniques, DiskGenius data recovery techniques are very simple because it offers DIY data recovery software. Let's see how to recover lost data with DiskGenius data recovery techniques. Step 1 Download and install DiskGenius. Firstly, download and install DiskGenius on your computer. This software offers advanced data recovery techniques to help you recover lost data from any data loss disaster. Step 2 Choose hard drive where your data is lost. Just run DiskGenius on your computer, it will list all hard drives on your computer. Just select the hard drive where your data is lost. Now, click "File Recovery". You will see a window to let you start to scan the hard drive. Just let it scan your hard drive to find lost data. After scanning, just preview and recover lost data easily. It is very simple and effective to rescue los data with DiskGenius data recovery techniques. It offers advanced scan technology to scan the drive and find every recoverable file. You don't have to spend much money on other data recovery techniques. DiskGenius is complete DIY data recovery software. It means you can recover lost data at anytime, at anywhere with this data recovery technique.